The Tiffany & Co. blue box is one of the most recognizable motifs of American luxury yet the name of the prestigious jeweler stamped on watch dials can spin watch geeks into a frenzy. With the addition of those magic words, Tiffany & Co., even the most ordinary watch can suddenly became the most desirable timepiece in the room. Founded in 1837 as a small fancy goods store by Charles Louis Tiffany, Tiffany & Co. soon became the place for wealthy socialites, aristocrats and world leaders to visit when traveling to New York. Tiffany & Co. started carrying Patek Philippe watches in 1847; just two years after Antoine-Norbert de Patek and Adrien Philippe began working together but still four years from the formal registration the company. It was clear to any shrewd businessman that America was set to be one of the biggest markets in the world and in 1851, as tariffs on imported watches and jewelry were lowered, Antoine Patek traveled to America to secure his place in the land of opportunity. After touring the country, Patek finished his travels in New York where he met with Charles Tiffany and the two men instantly took a liking to one another as they both shared a desire for excellence in their respective fields. Patek returned to Switzerland to discover that Tiffany had placed an order for 150 watches, an impressive order seeing that there was only a handshake and gentleman's agreement between the two men. In 1876, one year before the death of Antoine Patek, Tiffany would formalise their agreement in writing and declared that they would attend to the American interests of Patek Philippe & Co. as if it were their own. I couldn't find the first example of a double signed Patek Philippe sold at Tiffany's but the earliest example I could find was a pendant watch from 1889. Whilst Patek Philippe did not make the case, they did make the 10 ligne movement underneath the white enamel dial simply signed Tiffany & Co., New York. Patek Philippe are capable of amazing artistrty but it is not uncommon for them only to make the movement and leave the dial/case work to another craftsman. One watch that they certainly did make in it's entirety was a split-seconds chronograph that Tiffany & Co. sold in 1895 though the case, dial, cuvette (hinged display back) and movement were all signed Tiffany & Co. rather than Patek Philippe. 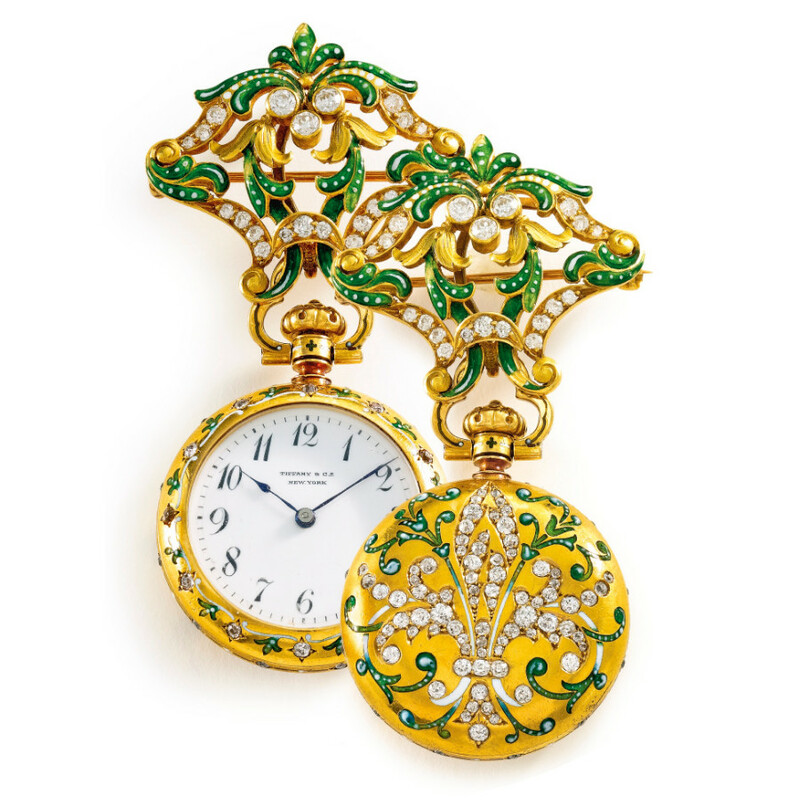 A Tiffany & Co. & Patek Philippe double-signed minute repeating pocket watch. Photo courtesy of Sotheby's. One of the earliest co-signed pocket watches I found is from 1920, a beautiful 18ct yellow gold minute repeater with a matching gold dial and Breguet numerals. It is interesting to see that it is Tiffany's name that takes precedence, then Patek's and finally Genève, Switzerland rather than the usual New York location used on other Tiffany timepieces. Not only is the dial co-signed by both the retailer and manufacturer, but so are the case and movement which make this piece quite special; however as you can see, the case has some pitting to it and it only achieved $20,000 at a Sotheby's auction in 2014. Whilst I've been able to find a wristwatch with a Tiffany only signed dial dating to 1917, the earliest co-signed wristwatch I could find dated to 1925, though again the Patek Philippe & Co. name is still underneath that of Tiffany. This focus on the retailer over the manufacturer is worlds apart from the current landscape we currently have in watchmaking. The first Patek Philippe wristwatch I could find that has the manufactures name on top is a Ref. 1450 'Top Hat' from 1943. This distinctive rectangular watch was in production from 1940 till 1960 and is named top hat not for the unique case shape but rather from the large, protruding curved crystal. This change in location of the signature, from twelve o'clock above the manufacturer to six o'clock beneath it, shows the slow pivot that Patek Philippe made from small batch and bespoke pieces to the more standardised and regimented reference based production we see today. As the world became smaller, this standardisation became a necessity for watchmakers who wanted to reach an increasingly larger market which unfortunately meant putting the end to the commonality of double-signed dials. The Patek Philippe Ref. 1450 "Top Hat" circa 1945. Photo courtesy of Tiffany. The double-signed dials of the mid to late-twentieth century are a time capsule of that simpler era of watchmaking. The appeal of these dials is exclusivity, the feeling of owning something that isn't easily obtained. Whilst there are thousands of Rolex stockists around the world, you could only get a Tiffany & Co. double signed watch if you went to one jeweler in the entire world. You also had to have gone there from the mid 1950's to the early 1990's as the relationship between Rolex and Tiffany & Co. was short lived. Since the mid-1950's, Tiffany started the practise of co-signing the dials of Rolex watches that were sold at their Fifth Avenue location. 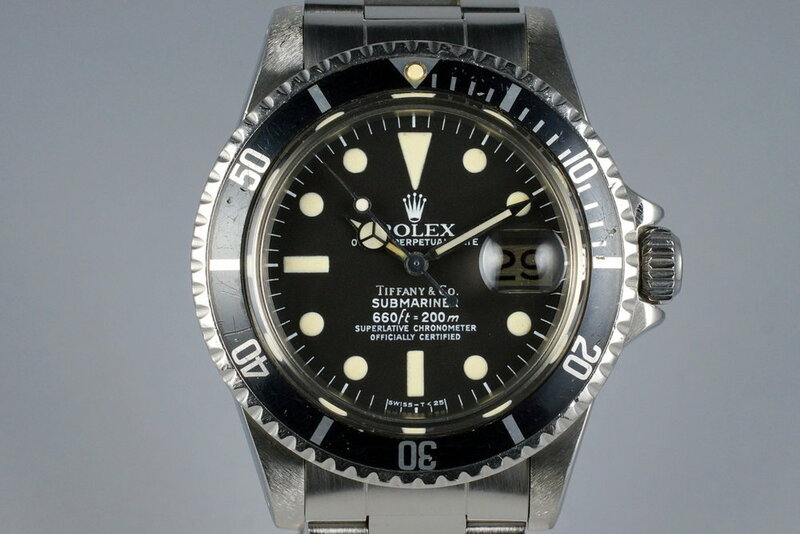 Depending on the model, the name placement would be done in a different place as not to overbalance the existing type on the dial; dress pieces would usually see the Tiffany & Co. name be stamped below Rolex but above the hands, tool watches would be stamped below the hands and above the lines of existing text. This stamping was solely done on-site by Tiffany & Co. until Rolex started instructing their dial manufacture in Switzerland to begin stamping dials meant for the jeweler. It's unknown whether Rolex did this to lighten the load for Tiffany & Co. or so that they could be more involved with the process. Tiffany didn't stop stamping dials and this has created a problem with collectors as the exact type, weight and placement of a Tiffany stamped dial vs. a Rolex stamped dial is different and those unfamiliar with the process can be easily duped. I am certainly not an expert when it comes to Rolex Tiffany dials so my advice will always be buy the seller, not the watch. If you're buying from a dealer you trust or from a reliable seller then you should be fine but be wary that even experts make mistake. Now if rumors are to believed, in the 1990s Rolex requested that Tiffany stop stamping their watches. It appears that Tiffany refused to do so which led to Rolex withdrawing their watches for sale from Tiffany and even refusing to service watches under warranty stamped at Tiffany's. Whilst Rolex hasn't seem to have suffered financially from withdrawing, I do think that in doing so they lost a valuable relationship with one of the most recognizable names in American luxury. Whilst they are no stranger to waiting lists, Rolex has never been fond of a limited edition watches so by stopping Tiffany from stamping dials, they were able to better control the price of their watches on the second-hand market. Now a Submariner sold at one luxury jeweler is just the same as another. As Tiffany's relationship with Rolex ended, their relationship with Patek Philippe grew stronger as the watchmaker released several limited edition watches to commemorate the anniversary of the original agreement between their founders. In 2008 Patek Philippe opened their first US boutique inside the Fifth Avenue Tiffany & Co. location, a huge 3000 square foot temple to the Genevan watchmaker complete with a collection of traveling museum pieces on loan from Switzerland. 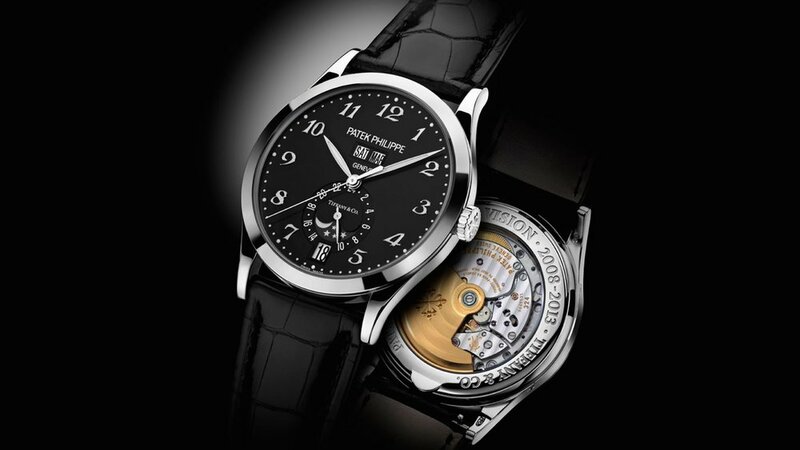 In 2012 Patek released the Tiffany dial Ref. 5396G, an annual calendar with a black dial and applied Breguet numerals that was limited to 100 pieces. Signed at six o'clock, in uniform type, were three magic words. Tiffany & Co.
Hodinkee: Introducing the Patek Philippe Ref. 5396G, Made Exclusively for Tiffany & Co.
Hodinkee: Why I Bought The Patek Philippe 5396G Limited Edition for Tiffany & Co.
Sotheby's: Important Watches Including the Titanium Collection, Lot 110, a Patek Philippe Ladies watch retailed by Tiffany & Co.
Tiffany & Co. : About Tiffany & Co.